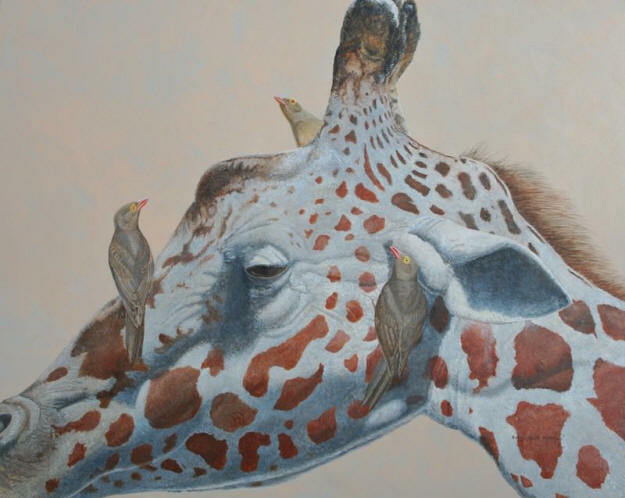 This painting is approximately life size, and shows three Red-billed Oxpeckers, a species found mostly in central and eastern Africa. They are closely realsted to the rather similar Yellow-billed Oxpecker (B. africanus), and between them comprise a family thought to be most closely related to the starlings and mynahs, and sometimes considered to be a subfamily within the larger starling family. Oxpeckers frequently crawl around on large mammals, both wild species and livestock, looking for ticks, flies, lice, mites, and hair and blood (probably from within the bodies of parasites consumed, although apparently they will take some blood from an open wound).